I finished reading this book right before a week of vacation, wrote half of what I wanted to write on chapter 10, but then didn’t pick up this task again until now. I’ve listened to chapter 10 twice and mulled on it, and the book for a while now. John Suk posted a review in GoodReads review. I posted what I think is probably my briefest summary of this book as a comment. It is in the end kind of a self-help book. He charts a course to help yourself to become the kind of person that David Brooks thinks you should be. This type of person embodies the virtues of 20th century “middle America” with a “now improved with better treatment of blacks, women and gays”. It’s a mid-century modern mainline ethos that tries to avoid the self-indulgent cliff he sees today. Now to what I started before vacation. The last chapter is the big reveal. We’ve had our box of chocolates biographies and now is the time to pull it all together into wisdom, or something that will help us develop a moral vocabulary which will help us develop character, or Adam II eulogy virtues. He opens the chapter with two more mini biographies, this time the tale of two quarterbacks, Johnny Unitas and Broadway Joe Namath. Unitas represents the pre-WWII culture of self-depreciation and team orientation while Namath represents the contemporary culture of self-expression and self-glorification. These trends are never uniform, Payton Manning kept coming to mind for me as someone who today in the NFL embodies the older ethos. In this last chapter he’ll move rapidly with more stories, examples and summaries. In some ways its an anthology of column summaries where he’ll talk about self-esteem, authenticity, social media, selfies, meritocracy, conditional love, and it will all culminate in his humility code, a list of observations, many of them centering upon dualities, that he finds helpful for guiding us towards developing Adam II eulogy virtues, not just Adam I resume virtues. (See the intro and this series for more on these concepts.) One thing about Brooks, he’s usually up front with his project and will tell you exactly what he wants. Many of us are in Ivan Ilyich’s position, recognizing that the social system we are part of pushes us to live out one sort of insufficient external life. But we have what Ilyich did not have: time to rectify it. The question is how. The answer must be to stand against, at least in part, the prevailing winds of culture. The answer must be to join a counterculture. To live a decent life, to build up the soul, it’s probably necessary to declare that the forces that encourage the Big Me, while necessary and liberating in many ways, have gone too far. We are out of balance. It’s probably necessary to have one foot in the world of achievement but another foot in a counterculture that is in tension with the achievement ethos. It’s probably necessary to reassert a balance between Adam I and Adam II and to understand that if anything, Adam II is more important than Adam I.
Brooks, David (2015-04-14). The Road to Character (p. 260). Random House Publishing Group. Kindle Edition. Brooks’ project reminds me of Qoheleth in the book of Ecclesiastes who examines everything under the sun. He sees vanity all over, in all especially in his Adam I pursuits. Some see his conclusion at the end of the book as a pious addition, or punting into religious superstition or sentimentality. 9 Not only was the Teacher wise, but he also taught knowledge to the people; he carefully evaluated and arranged many proverbs. 10 The Teacher sought to find delightful words, and to write accurately truthful sayings. 11 The words of the sages are like prods, and the collected sayings are like firmly fixed nails; they are given by one shepherd. 12 Be warned, my son, of anything in addition to them. There is no end to the making of many books, and much study is exhausting to the body. 13 Having heard everything, I have reached this conclusion: Fear God and keep his commandments, because this is the whole duty of man. 14 For God will evaluate every deed, including every secret thing, whether good or evil. Brooks in this book can get all the way to verse 13 and 14. His advice would be that religion might be a helpful source of wisdom so pursue those disciplines if they help in the development of Adam II eulogy virtues. There is much wisdom on Brooks’ Humility Code. Many Christians I know will value and endorse much of what he says. Brooks is a contemporary moderate. Over and over again I see Brooks as being very at home in mid-century mainline Christianity. He regularly quotes Tillich and Niebuhr. Even though he hasn’t come out as a Christian I can see him fitting easily in that tradition, urbane, educated, well-spoken, seeing the value of ritual and tradition applied for the orderly welfare of a great society. He is of course the “conservative” voice at two of the most prestigious middle brow moderately liberal institutions in the press today, the New York Times and the News Hour. Should we be surprised by any of this? Brooks is the kind of conservative CRC elites like to love. He matches our brand of secular, Christendom stoicism even if he doesn’t have a Dutch surname. He does well with Calvin grads, Christian school teachers, and CRC pastors who favor women in office. If we begin the chapter talking about Unitas and Broadway Joe, the Brooks quarterback would be Payton Manning. In some ways Brooks’ work is about helping people who already have a considerable amount of Adam I accomplishments balance out themselves with Adam II. To restore the balance, to rediscover Adam II, to cultivate the eulogy virtues, it’s probably necessary to revive and follow what we accidentally left behind: the counter-tradition of moral realism, or what I’ve been calling the crooked-timber school. It’s probably necessary to build a moral ecology based on the ideas of this school, to follow its answers to the most important questions: Toward what should I orient my life? Who am I and what is my nature? How do I mold my nature to make it gradually better day by day? What virtues are the most important to cultivate and what weaknesses should I fear the most? How can I raise my children with a true sense of who they are and a practical set of ideas about how to travel the long road to character? Brooks, David (2015-04-14). The Road to Character (p. 261). Random House Publishing Group. Kindle Edition. Brooks wants to know how to be a better person but he does not sit in the same world as Qoheleth. Qoheleth explores life “under the sun” and Brooks, by virtue of the secular box must stay within similar restraints. Brooks however faces a postmodern world where Taylor’s Nova Effect multiplies narratives that afford meaning. Qoheleth could put the question into the arms of a judging God who could at some point make an ultimate assessment, Brooks asserts the supremacy of Adam II virtues over Adam I, at least for those who can afford the choice of them, yet how can his assertion go beyond his personal choice? John Suk picked up on a lot of what I felt. This is a book for middle class people with time and space to ponder their lives and consider moderate to conservative adjustments. That’s not a bad thing, because that’s his audience. David Brooks evaluates “the good life” and makes his contribution, but in a sense I’m not sure we’re really past Adam I. Most of these Adam II virtues were given in illustrations of very successful notable people. On what basis do we talk about significance? In an interview Yuval Harari lays out what he considers to be the quintessential homo sapien skill that separates us from the rest of the animal kingdom. The truly unique trait of Sapiens is our ability to create and believe fiction. All other animals use their communication system to describe reality. We use our communication system to create new realities. Of course not all fictions are shared by all humans, but at least one has become universal in our world, and this is money. Dollar bills have absolutely no value except in our collective imagination, but everybody believes in the dollar bill. The world’s most popular religion is money. People will believe all sorts of things but when it comes down to money nearly everyone gets serious. I always find it instructive that Jesus himself says that the great choice is “God and mammon”, not “God vs. Satan” or “God vs. evil”. I got this link from a Tim Keller piece which essentially says that when there are no meta-narratives that govern “the good” what we, together as a species basically do is bottom online onto money. There is no single narrative, no privileged standpoint, no system or theory that overlays all others. Hence, Lyotard argued, all narratives exist together, side by side, with none dominating. This confluence of narratives is the essence of postmodernism. Let’s go back to the arts, the front line. It is not that postmodernism’s impact is diminished or disappearing. Not at all; we can’t unlearn a great idea. But rather, postmodernism is itself being replaced as the dominant discourse and is now taking its place on the artistic and intellectual palette alongside all the other great ideas and movements. In the same way as we are all a little Victorian at times, a little modernist, a little Romantic, so we are all, and will forever be, children of postmodernism. (This in itself is, of course, a postmodern idea.) All these movements subtly inform our imaginations and the way we discuss, create, react and interact. But, more and more, postmodernism is becoming “just” another one of the colours we might use. (Lady Gaga uses it, for example; but Adele does not.) Or, to switch metaphor, just another tool in the artist’s kit. Why? Because we are all becoming more comfortable with the idea of holding two irreconcilable ideas in our heads: that no system of meaning can have a monopoly on the truth, but that we still have to render the truth through our chosen system of meaning. So the postmodern challenge, while no less radical, somehow feels less powerful to us. We are learning to live with it. For a while, as communism began to collapse, the supremacy of western capitalism seemed best challenged by deploying the ironic tactics of postmodernism. Over time, though, a new difficulty was created: because postmodernism attacks everything, a mood of confusion and uncertainty began to grow and flourish until, in recent years, it became ubiquitous. A lack of confidence in the tenets, skills and aesthetics of literature permeated the culture and few felt secure or able or skilled enough or politically permitted to distinguish or recognise the schlock from the not. And so, sure enough, in the absence of any aesthetic criteria, it became more and more useful to assess the value of works according to the profits they yielded. Capital, as has been said many times before, accommodates all needs. So, paradoxically, we arrive at a moment where literature itself has become threatened, first by the artistic credo of postmodernism (the death of the author) and second by the unintended result of that credo, the hegemony of the marketplace. What then becomes sought and desired are fictions that resonate with the widest possible public: that is, with as many discourses as possible. This public can then give or withhold approval measured in sales. In other words, increasingly, artistic success has become about nothing except money; and, increasingly, artists have come to judge their own success that way, too. This is the reason today that we feel the genre writer’s cry “I sold millions” so powerfully, even though in truth it can say little about the art form other than “it sold millions.” Changing disciplines, if we take this commoditisation of art to its natural limit, we arrive at Damien Hirst’s diamond encrusted skull, For the Love of God (2007). Commoditisation has here become the only point. The work, such as it is, centres on its cost and value and comprises also (I would say mainly) the media storm surrounding it: the rumours that it was bought for £50m, or that Hirst himself bought it, or that he offset his tax bill by claiming diamonds as tax deductible artistic materials, or that he didn’t buy it at all, or that nobody has bought it… And so postmodernly on. The paradox being this: that by removing all criteria, we are left with nothing but the market. The opposite of what postmodernism originally intended. I wonder how well Brook’s image of “the good” works if your life is short, anonymous and painful. I’m not saying that Brook’s imagine of the good isn’t better than scapping for survival, but given the limitation of its vision “under the sun” without any expectations of anything beyond the grave does it make sense. To say it in another way is Adam II fundamentally an aesthetic quality that only those who have achieved middle class success at Adam I can afford. I think this is what sets Brooks apart from Qohelet and his final chapter in Ecclesiastes. In the end, however, I very much enjoyed the book and found it well worth reading. Pastors (as I did today) will find good writing, apt phrasing and some terrific illustration material for teaching and preaching. The box of chocolate biographies are wonderful, entertaining, illuminating, worthwhile. Brooks is helpful but won’t go beyond the box he, or we, have confined him too. He writes not as a Christian author (if he has become one) but as a secular columnist writing a self-help sort of book for people who want to become better people along the lines of civil-rights-movements-updated mid-century mainline Americans. 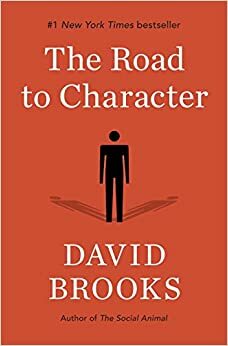 This entry was posted in book review and tagged David Brooks, The Road to Character. Bookmark the permalink.